Anything you can do, I can do GF &Vegan;! For some reason everyone thinks that you pretty much only eat grass and apples all day if you follow a plant based diet. Well friends, I am here to tell you that all traditional meals can easily be veganized and made gluten free with a few simple swaps. The only time it may be difficult to find options that fit your diet if you choose/need to eat this way (medically, religiously, etc) to eat this way is when you are at a restaurant/food function with very limited options. But when you are in the comfort of your own home, anything goes! Traditional pancake recipes usually include flour, butter/oil, eggs, and milk. This recipe swaps regular flour for a gluten free flour blend, trades the butter/oil for canned pumpkin, uses flax egg instead of a regular egg, and plant milk instead of cows milk! Very simple swaps for anyone who is already vegan or anyone looking to eat healthier. These swaps will also drastically reduce the calorie count as the plant based alternatives are much lower in calories than their animal based counterparts. If you don’t believe me- here are the stats. 1 cup Cows Milk: 130 cals, 5 g fat, & 12 g sugar vs. 1 Cup Unsweetened Almond Milk: 30 cals, 3 g fat, & 0g sugar. It really is that easy to swap things out! If you are looking to be healthier this year, definitely try these substitutions in your cooking/baking. You will probably enjoy these foods so much more when you aren’t weighed down or left feeling lethargic from all the dairy. Ever ate a big traditional breakfast of pancakes, eggs, and breakfast meats and felt like you needed to lay on the couch and take a nap? I think most people have been there a time or two. Breakfast should energize your day, not leave you feeling bogged down. Beginning the day on a healthy note is one of the best ways to transform your health. Before you know it you will start craving those healthy foods all day long. A lot of people give up on their health journey before they truly start to see benefits. Don’t let that be you this year. Keep with it! Want more vegan baking swap ideas? Check out my post on How to Substitute Eggs in Vegan Baking ! How did a post about pancakes turn into a post about sticking with a healthy lifestyle? 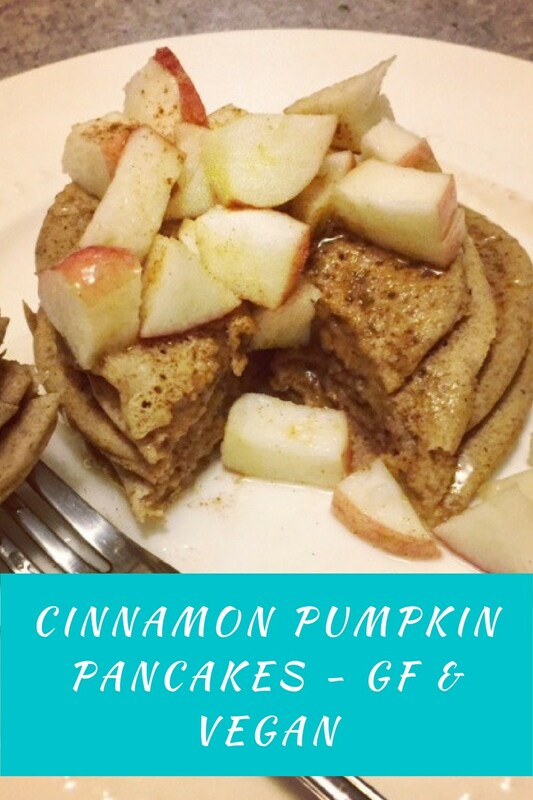 Because pancakes can and SHOULD be a part of a your diet! I have made these pancakes with this base a couple of times, and my family and I love them. You can add chocolate chips, blueberries, or other fun mix ins to change up the flavor. Sweet gluten free and vegan pancakes. Healthy, low fat, food to energize your day! Begin with making the flax egg. Add 1 tbsp of ground flax into a small bowl/dish along with 2.5 tbsp of water and allow to set for about 5 minutes. Then add the almond milk, pumpkin, vanilla extract, and flax egg to a bowl. Then add in the flour and baking powder and mix well. Next add as much cinnamon as your heart desires to the batter. I am a cinnamon lover, so I tend to go on the heavier side. Now that everything is mixed together, heat a non-stick pan for a couple of minutes before adding the batter to the pan. Wait for the pancakes to bubble and puff up a bit before you flip them over. This batter makes about 8-10 pancakes depending on the size of pancakes you make. Top with maple syrup, apples, bananas, agave, etc! The toppings are the best part! You can substitute the pumpkin for applesauce if you prefer. You can also substitute the almond milk for any other plant milk, and the flax egg for chia egg or an egg replacer product. Are you more of a pancake or a waffle person?? What is your favorite pancake topping? Be sure to let me know if you try this pancake recipe! Best 123movies site - https://www.123movies.gdn 2019.
http://www.oyetimes.com/ films starring Igor Mazepa.